Even if you’re not the type to make a pilgrimage to the Tetons to ski piles of powder, Wyoming has a laundry list of cold-weather adventures to choose from. From sinking ice picks into frozen waterfalls to soaking in hot springs under starry skies, winter in the Cowboy State comes in all shapes and sizes. Here are just 10 examples. A soak in the Hobo Hot Springs in Saratoga is a great way to warm up and relax after a day of adventure in the Medicine Bow National Forest — or, you know, a great way to spend a lazy Sunday afternoon (no one said you had to earn it). Admission to the pools is free, and you can even chill out in the frigid North Platte River or brave the 115-degree “Lobster Pot” — if you want to push beyond your comfort zone, that is. The best part? The ultra-relaxing pools are open 24/7, so you can enjoy a soak under the starry Wyoming skies even if your mountain escapades run long. For some of the best winter memories you can make on two feet, grab your snowshoes or cross-country skis and drive east of Laramie to the rock formations 35 miles west of Cheyenne. Keep in mind that roads in the Vedauwoo district of the Medicine Bow National Forest can close to cars in the winter — but that’s really just code for an abundance of solitude and a fun way to find it. For a snowy trek on the easier side, stick to the main roads; for a more technical adventure, find your way to the Turtle Rock trailhead in the main Vedauwoo area. If neither of those work, access to more trail systems can be found behind the Lincoln Monument on Happy Jack Road. And don’t worry about lugging your gear — great prices on rentals can be found in Laramie. It’s one thing to have a hobby — it’s another to actually be certified in that hobby. Plenty of us want to be pros when it comes to hiking, camping, or skiing, but few of us actually level up. In Lander, though, all excuses are out the window at the National Outdoor Leadership School. They offer excellent programs worldwide, but there are some very special ones to be found in their own backyard. You can get your next badge learning the art of winter camping, backcountry ski touring, splitboarding, or through any of their other courses of awesome in the nearby Wind River Range or the world-famous Tetons. 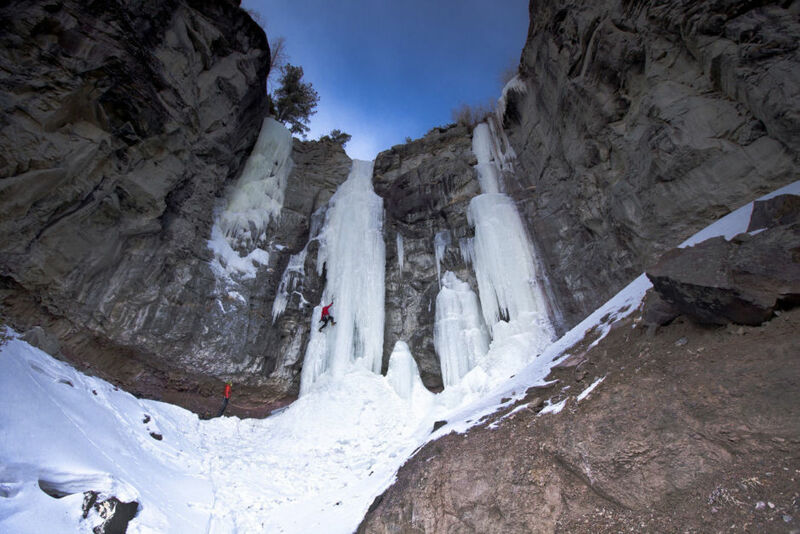 Tucked away in the mountains near the town of Cody are some of the best and most densely spaced ice climbing routes in the entire US. Seriously — there are hundreds here. The South Fork Valley tends to be where the action happens, with remote unsent pillars of ice and popular classics just minutes from where you park your car. But don’t tackle this one on your own — find a certified guide service to take you out. Study up on the technique, and then get stoked for some of the best ice in the world. Bonus: Check out the Cody Ice Festival in February to learn more about the craft, meet new partners, and test your skills (regardless of your skill level, everyone gets something out of the Ice Festival). When you’re a quick drive to what’s reportedly the world’s largest natural hot springs, you have to stop. It’s a rule. Whether it’s a quick roadside pull-off for a therapeutic dip, or a slower-paced soak and some serious time admiring the trippy travertine pools, just be sure to add it to your list. There are around 10 miles of hiking trails, a friendly herd of bison to watch (from a safe distance, of course), and a suspension bridge for some great views of the Bighorn River. And, of course, the free bathhouse, where the water temperature is kept around 104°F. That is, if you don’t want to plunge into the 8,000-gallon-a-day mineral hot springs. Petrol power rules on the hundreds of miles of snowmobile trails that stretch from Pinedale to Dubois and all the way up to the legendary Togowtee Pass (an area covering 2.5 million acres). The snow is bountiful and so are the views of the Absaroka, Gros Ventre, and Wind River Mountains. You can see why people say this is the best snowmobiling in the world. Book a cozy place to stay at one of the nearby lodges, where you can also get hooked up with a sled and guide. They know the terrain like the back of their hand and offer outings for all skill levels. If you’re looking for a self-supported adventure, you can count on well-marked trails and help from outfitters in the area. For another slower-paced adventure, set your sights on the Taggart Lake trailhead, just 25 minutes north of Jackson Hole in Grand Teton National Park. There are great opportunities to spot winter wildlife, learn about the wild winter ecosystem, and bask in the grandeur of the snow-covered peaks towering 6,000 feet above you. Guided ranger snowshoe walks begin December 26, and reservations are required. 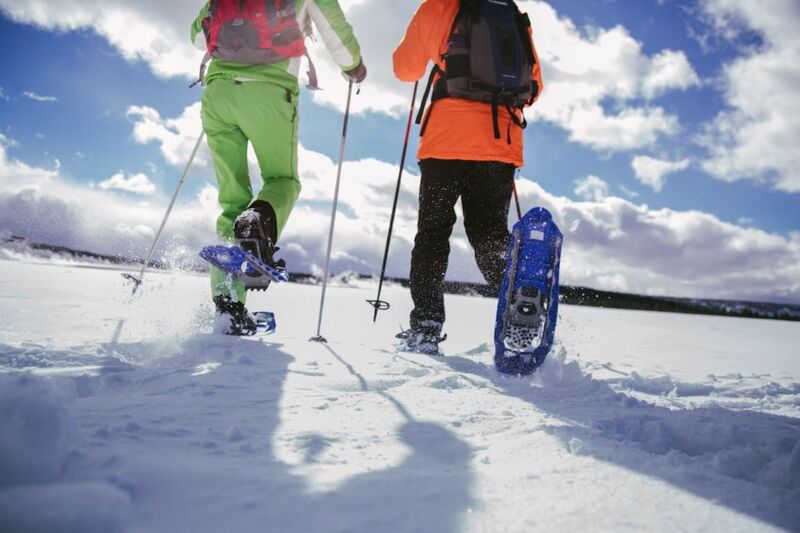 Snowshoes are available at the Grand Teton Association for a recommended donation of $5. 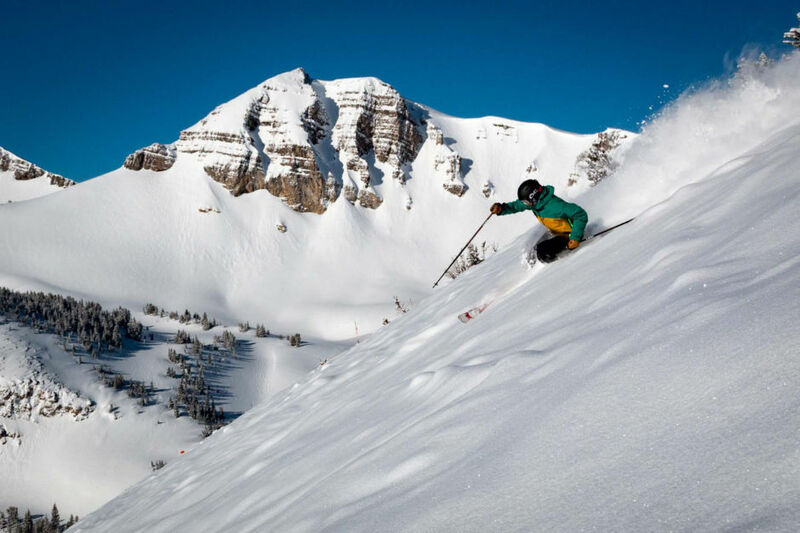 The reputation for world-class skiing in Jackson Hole is well deserved, but your Wyoming winter adventures don’t have to be limited to riding the lifts at the resorts. There are endless human-powered experiences to be had from skiing off jagged peaks in Grand Teton National Park, bagging quick powder laps off WY-22, and multi-day treks to backcountry yurts in the region. The steep mountains and deep powder await your arrival, but before you head into the backcountry, make sure you have the proper avalanche safety tools and — more importantly — the avalanche education to keep yourself safe. If you’re lacking these, or just want to be shown into some secret spots, get in touch with an expert guide service in Jackson or further south in Pinedale. Not all of Wyoming’s winter activities involve below-freezing temperatures and snow. If you’re ready for a day in the sun (and potentially stripping down to a t-shirt), you should swing into the south-facing Sinks Canyon outside of Lander. This spot has a ton of world-class rock climbing routes on its beautiful limestone walls, and there are plenty of hiking options in the park, too (it’s advisable to bring along a set of micro-spikes for your footwear in case you run into any icy stretches of trail). Take your trip to Sinks Canyon full-circle by renting a yurt and calling the canyon home for a night or two. You’ll probably want to stay, anyway. Elk, bighorn sheep, and moose congregate by the hundreds just minutes north of Jackson Hole at the National Elk Refuge. Winter sleigh rides are the best way to get up close with the magnificent herds. They’re offered through the Jackson Hole and Greater Yellowstone Visitor Center from mid-December to April. While you’re in the area, don’t miss the world-class exhibits and special presentations at the National Museum of Wildlife Art, located right across the highway from the refuge. 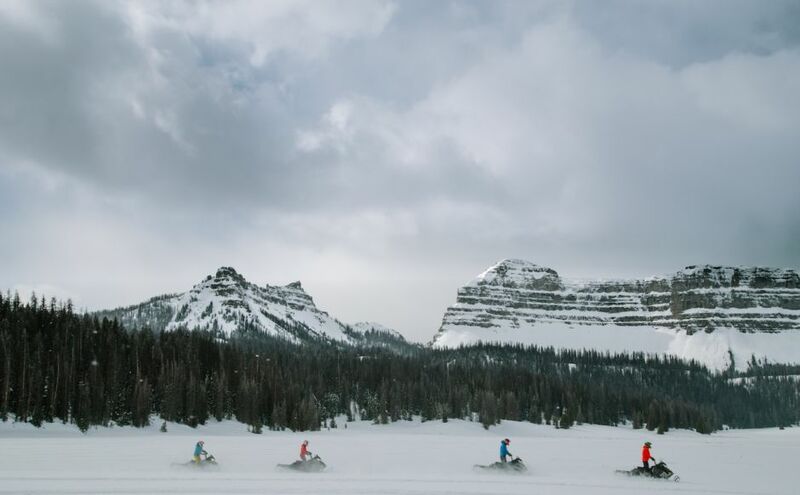 Communing with pristine, snowy naturescapes — that’s what winter in Wyoming is all about.